This is a new and pure manicure treatment which enhances the beauty of your nails providing you with the smudge-proof nail color lasting for weeks without chipping. Clients when see this manicure treatment for the first time, they want to know the details and also will to get that. The special thing in this nail polish is Shellac which is brushes as just found on the regular nail polish. The prepping of nails is same as a basic manicure. 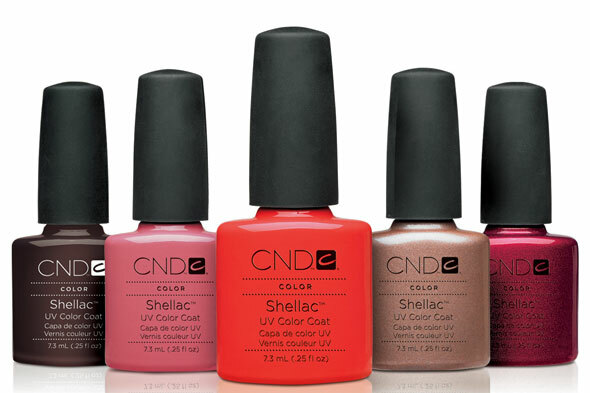 Shellac is a brand of the California Company that is called "Creative Nail Design", commonly known as CND. Company states that it took about five years for the proper manufacture of this product. Shellac is probably concerned with the hybrid of the popular gel manicure. A thick substance is applied to the nail for building up a new surface with gels. UV or LED light is therefore used to harden up the gel. After that it becomes smooth before adding polish. There have been chances of nail damage so customers give low marks to the gels. The reason of damaging nails is the result of soaking nails and fingers in strong acetone used for removing the residues. Shellac offers more nail-friendly solutions by taking the gel to the next level. It means no sculpting or filing methods. After doing the top coat, you get a quick shining effect with a soft cloth and alcohol. Quick, easy, out the door method. It is important to have natural nails and nail beds must be healthy for applying Shellac manicure. Therefore, it is said that Shellac is not for everyone. In case, nails are splitting, peeling or damaging from using acrylic or gel enhancements, it is necessary to consult with a licensed, trained and nail care professional. If you want to do Shellac by your own then you make sure that the manufacture only sells to the licensed professionals. People often go to the salon for taking this manicure as they become afraid of having it at home. So the professionals see more clients come back and forth to have it and remove it too. It is stated by a spokeswoman for CND that any of the Shellac products that you see in online advertising is being solid illegally along with the special UV lamps. You can’t take it easy at home by just buying a bottle. Without the lamp, polish will not properly set. CND is very specific about removal. In salon, a special wrapping process is done using strong acetone. The advantage of wrapping is isolating the chemical to the nail color and it readily creates body head to help the polish come off easily. Some customers have reported about having the acetone-soaked cotton placed in their nails. Ahern said that the process spoils when it is done by unprofessional, unlicensed and untrained person. The price of Shellac manicure is two times greater than the price of a basic manicure. In industry, the Shellac manicure treatment set is ranges from $30 to $40. In case, if you only need to remove polish with no reapplication then it costs only about $5. You can also find an opportunity to claim the people who are selling different and local Shellac manicure products. CND’s public relation company is being aware with the competitors that are already giving a good response towards their own versions of long-lasting, chip free polish. The UV exposure, the company insists its UV lamps that are just like low-watt UV bulbs supposed to filter out most of the damaging rays. It has been scientifically tested to be safer than the exposure your hands get from driving in the sun without gloves. Wide array of affordable products for your nail and beauty salon needs. Best prices on name brand items like CND Shellac, Essie, China Glaze, Oster, and more. Here are Manicure supplies, Gel Nail Polish, Shellac Nail Polish, Barber Shop Supplies, Hair Cutting Shears, Spray Tanning Equipment, Shellac Nail Polish and Hot Shave Lather Machine.